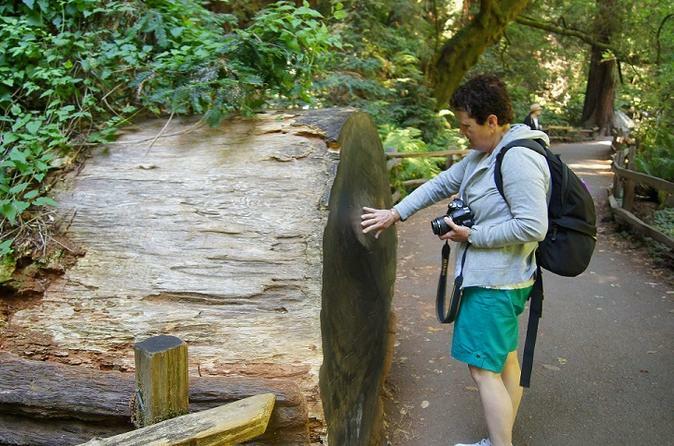 Just minutes from your cruise ship, you can disembark and join us on a variety of departure times for our Muir Woods Tour available at 9am, 11am, 2pm, where you will be quickly whisked away to redwood country here in Northern California. Venture north over the Golden Gate Bridge to an isolated canyon filled with ancient coastal redwood trees, also known as Muir Woods National Monument. Enjoy solitude and peace, through the cool, moist air, as you stroll through 1000-year-old trees towering 260 feet tall. Venture north over the Golden Gate Bridge to an isolated canyon filled with ancient coastal redwood trees, also known as Muir Woods National Monument. Enjoy solitude and peace, through the cool, moist air, as you stroll through 1000-year-old trees towering 260 feet tall. Experience the awe and wonder as you are treated through Northern California’s signature fog, while you wander in and out of the Mother Nature’s redwood alleyways. The canopy of coastal redwoods soaring above will stimulate all of your senses as you journey through a piece of ancient California history. You will never forget the crisp, fresh redwood fragrance that will surround you on your journey to the majestic Muir Woods National Monument. Entrance fee into Muir Woods included in the tour.